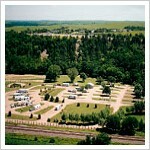 Mill Creek Campground is a small (less than 50 sites) but very nice park with large, level sites and plenty of room. Big rigs are no problem… you can get around the park easily and they have good size pull-thrus. Mill Creek very clean and well maintained. The campgound is within walking distance of Paxico, a small town that has 7 or 8 antique shops and a little cafe. There’s no pool, but there is a creek for swimming, tubing and fishing. Amenities also include a playground, picnic pavilion, Bath/shower house, laundry, and hiking trails. Mill Creek is a great overnight stop with one exception… the campground is located next to a fairly busy railroad line and trains run thru several times a night.